James Stack, who predicted the 2008 U.S. real estate crash and nailed last year’s housing slowdown with uncanny timing, is back with some bad news for 2019. Last January, Stack was practically alone when he warned rising mortgage rates would expose housing’s affordability problem and “the risk that today’s highly inflated housing market will again end badly.” The day after Bloomberg published his comments on Jan. 22, homebuilder shares began a 10-day slide, and ended the year down by more than a third. Almost a year later, the signs of coming distress in property markets -- and the broader economy -- are only increasing, said Stack. Home purchase contracts in the U.S. fell 7.7 per cent in November, according to a National Association of Realtors index. Consumer confidence dropped in December. And a gauge of U.S. manufacturing plunged by the most since 2008, only a day after Apple cut its sales outlook, prompting investor worries about a global growth slowdown. Stack, who manages US$1.3 billion for people with a high net worth from his office in Whitefish, Montana, studies his fireproof files of newspaper articles on bear markets dating back to 1929. He predicted the housing crash in 2005, just before prices reached their peak. 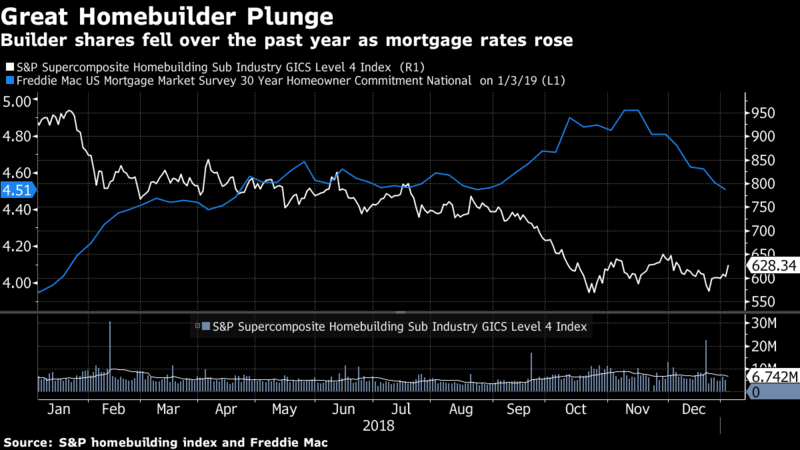 Last year’s warning came after Stack noticed that his "Housing Bubble Bellwether Barometer" of homebuilder and mortgage stocks was up 80 per cent in a year, a sign that investors once again had gotten too "exuberant." He says it’s too early to know if housing is in another bubble. It will depend on what happens with the economy. "Unfortunately, bubbles are only recognized with 100 per cent certainty in 20/20 hindsight," he says. To be sure, economic strength should be playing to housing’s benefit. While rates for 30-year mortgages peaked at 4.94 per cent in November, climbing a per centage point since the start of 2018, they’ve since fallen to 4.51 per cent. And the U.S. unemployment rate is near a five-decade low, with employers in December adding the most workers in 10 months. But Stack says the damage is done. "Even if mortgage rates level off or ease slightly in 2019, we are unlikely to see the psychology turnaround," Stack said. "Homebuyers have woken up to the fact that affordability is a major issue. Can they afford the home?"